You’ve got a friend in me… Now that you have the tune in your head, think about Disney friends. Picture certain faces from different places and spaces of Disney history. The possibilities are rather interesting and fun to think a little outside of the box. This week, the theme of the Disney Wordless Wednesday is Disney Friends. Such great pictures! I love the one of the Captain Hook and Smee puppets. Captain Hook might be my favorite villain! Those are fabulous! I LOVE that Dumbo statue! One of my faves! Awesome pics….I love the Mickey fishing! Looking at all the pix this week makes me even that more anxious for October to come so I can get back there! 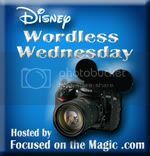 Debs at Focused on the Magic´s last blog post ..Wordless Wednesday ~ Disney Friends! Beautiful shots! The song is stuck in my head now. :) I love the Mickey and Pluto shot. They’re all great shots, but I love the thought of Mickey and Pluto as best friends. They’re the perfect pair for a Disney friends post. Love the pics!! Oh how my daughter would LOVE to get a pic with Sharky and Bones! Too cool!! Wow you’ve got a great collection of Disney friends pictures! You must take pictures of everything when you’re at the parks. I love the Dumbo statue, I don’t think I’ve seen that one before. And I know I’ve never seen the Potato Head couple, fun!